Provide comfort for the family of EDGAR AKEL with a meaningful gesture of sympathy. Edgar Clyde Akel (Mar 14, 1919 - Mar 30, 2019) of Mill Creek Assisted Living in Marquette, passed in his sleep, 100+ years old--soldier, displaced person, father, grandfather, great-grandfather, husband for 71 years, patriotic Estonian, successful American immigrant, dancer, gardener, wood cutter--a man who lived large. We will miss his presence in our lives. Edgar was born on March 14, 1919, in the republic of Estonia in the village of Abja, the youngest son of Ann and Hendrik Akel. An officer in the Estonian army in 1939, he met his future wife Aino Palu at a school dance. They married in 1941 and were together for 71 years before she preceded him in death in 2012. When Estonia was conquered by the Soviet Union in 1944, Edgar and Aino escaped to Germany with their young daughter, Viive. They lived in the American zone in Freising, Germany, where Edgar worked for the US Military Government court and where their second daughter, Marianne, was born in 1947. In June 1949 the family immigrated to the Marquette area, sponsored by the Charles Francisco family. 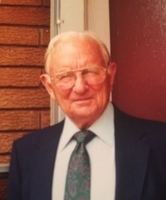 Edgar owned and operated the Pioneer Insurance Agency in Negaunee from 1956 to 1978 when he retired at age 59. Edgar and Aino lived on 40 acres off County Road 480 where Edgar was an avid Master Gardener who grew his own fruits and vegetables, skied, took saunas, read books, traveled, and was a booster of life in the UP. Edgar returned to his homeland for the first time in 1990 when Estonia was still under soviet rule. After Estonia became independent in 1991, Edgar and Aino returned several times to visit friends and relatives. Edgar is survived by his two daughters, Viive (Ken) Morin of Fairhope, Alabama and Marianne (Alan) Brokaw of Houghton; four grandchildren: Kellie (Paul Smith) Morin of Madison, Tiina Morin Harris of Negaunee, Marika (Matt) Seigel of Houghton, and Tomas Brokaw of Chicago; five great-grandchildren: Ender and Endla Harris, Connor Smith, Annika and Indrek Seigel. Edgar was preceeded in death by his parents, his brother Heinrich Akel (1975), his wife Aino Akel (2012), and infant grandson Karl Brokaw (1971). Private family memorials and celebrations of Edgar’s life will be held in Marquette and also in Estonia. The family thanks everyone who supported them during this difficult time and is especially grateful for the loving care provided by Lake Superior Hospice staff and volunteers as well as the staff at Mill Creek. In lieu of flowers, the family suggests donations to Lake Superior Hospice. To send flowers in memory of EDGAR CLYDE AKEL, please visit our Heartfelt Sympathies Store.